Introduction Sedentariness is associated with chronic health conditions, impaired cognitive function and obesity. Work contributes significantly to sedentariness because many work tasks necessitate sitting. Few sustained solutions exist to reverse workplace sedentariness. Here, we evaluated a chair and an under-table device that were designed to promote fidgeting while seated. Our hypothesis was that an under-table leg-fidget bar and/or a fidget-promoting chair significantly increased energy expenditure. We compared these devices with chair-based exercise and walking. Materials and methods We measured energy expenditure and heart rate in 16 people while they sat and worked using a standard chair, an under-desk device that encourages leg fidgeting and a fidget-promoting chair. We compared outcomes with chair-based exercise and walking. 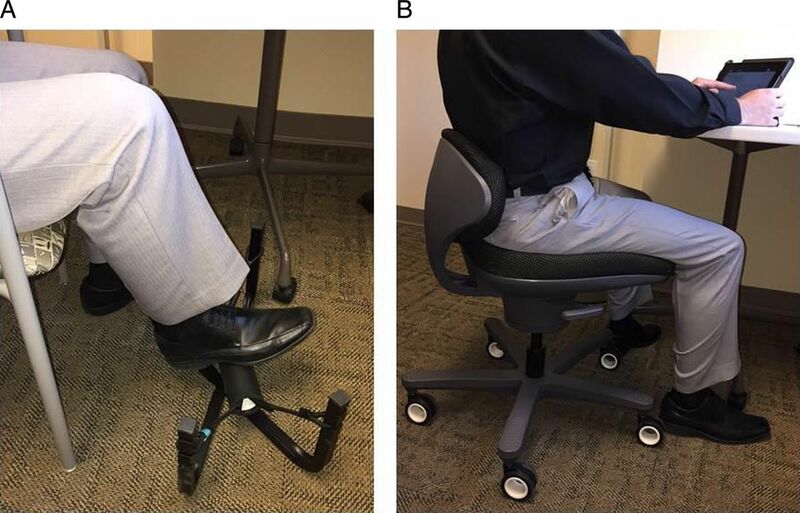 Results Energy expenditure increased significantly while using either an under-table leg-fidget bar or a fidget-promoting chair, when compared to the standard office chair (standard chair, 76±31 kcal/hour; leg-fidget bar, 98±42 kcal/hour (p<0.001); fidget chair, 89±40 kcal/hour (p=0.03)). However, heart rate did not increase significantly in either case. Bouts of exercise performed while seated provided energetic and heart rate equivalency to walking at 2 mph. Conclusions Chairs and devices that promote fidgeting can increase energy expenditure by ∼20–30% but not increase heart rate. Dynamic sitting may be among a lexicon of options to help people move more while at work. It is clear that chair-based fidgeting can increase energy expenditure. Chair-based fidgeting may be part of corporate weight maintenance or weight loss programmes. Chair-based fidgeting may be recommended by the medical community to reduce sedentary time at work. Sedentariness is associated with a myriad of chronic diseases, impaired cognition1 and obesity.2–5 The mechanism by which sitting excessively causes disease is not well understood, but it is known that breaking up sitting improves insulin sensitivity and lipids.6 Several studies have examined the effectiveness of programmes to displace sitting with standing or walking while working.7 ,8 These measures can effectively decrease sitting time and improve productivity6 ,9 ,10 although their long-term health benefits have not been proven. When a person walks at even 1 mph, energy expenditure doubles when compared to basal metabolic rate.11 ,12 Sitting, however even while fidgeting, is not substantially exothermic (5–10% increase above basal metabolic rate).13–15 We wanted to assess whether chairs that promote ‘dynamic sitting’16 ,17 can increase energy expenditure significantly above resting values. To this end, we examined the thermogenic impact of a chair designed specifically to encourage body fidgeting and an under-desk device that encourages leg fidgeting. In both cases, we measured the changes in energy expenditure and heart rate that accompanied their use. In order to better understand how we can encourage movement in people who need to work seated, we also examined the thermogenic and heart rate responses to chair-based exercises delivered through video. We compared these conditions to a 2 mph walk since walking is known to improve health.18 Our hypothesis was that chairs and gadgets designed to promote fidgeting while seated are associated with an increase in energy expenditure. The null hypothesis was that chair-promoted fidgeting does not increase energy expenditure above resting values. Secondary hypotheses examined how ‘dynamic sitting’ influenced heart rate. Participants provided informed written consent, and the Mayo Clinic Institutional Review Board approved the protocol. Sixteen participants (nine women and seven men) were included with a mean (±SD) age, 23±5 years and body mass index (BMI), 26±5.5 kg/m2 (table 1). Standard office chair (control chair): The criterion model chair is a standard office chair (Steelcase; Grand Rapids, Michigan, USA). FootFidget, http://footfidget.com (FootFidget, Lake Zurich, Illinois, USA) (figure 1), is an under-desk elasticated footrest that encourages leg activity while seated. It comprises of a steel 17″×10″×10″ frame support base. The elasticised central footpad consists of a 7″ foam-covered cylindrical rigid tube centred on two 17″ flexible resistance cords that run through the tube and attach to the four upright legs on the stand. The user repeatedly ‘bounces’ their foot on the cylindrical tube that encounters resistance. (A) FootFidget, http://footfidget.com, and (B) CoreChair, https://www.corechair.com. CoreChair, https://www.corechair.com (CoreChair, Aurora, Ontario, Canada) (figure 1), is a chair designed to promote activity while a person stays seated. It is a modified five-wheel office chair. It has a low, 9″ backrest with adjustable depth and is without armrests. The seat is sculpted and covered in 2″ thick foam padding. The main feature of the CoreChair is the mechanical core that allows for lateral movement while seated. Severity of seat tilt is adjustable and has a range of motion up to 14° in all directions. For the study trial, tilt severity was set to allow for the greatest range of motion. Interchangeable centre columns of different lengths (tall and short) make the chair height-adjustable. Participants were tested in thermal comfort, 2 hours after eating and after 30 min of rest. Prior to testing, patients were shown the equipment and the experimental protocol was explained. Participants were weighed using a calibrated Seca 769 scale in light clothing (athletic shorts and t-shirt), and height was measured using a Seca 219 stadiometer without shoes (Seca, Chino, California, USA). Participants were asked to sit on a standard office chair (Steelcase Criterion) for 20 min while working, checking email or using the internet. During this time, energy expenditure and heart rate were monitored. Participants then continued their work-like activities and were provided with the FootFidget. Energy expenditure and heart rate were measured for 20 min. Participants then sat on the CoreChair during which time energy expenditure and heart rate were measured for 20 min. Participants remained sitting in the CoreChair, stopped their work-like activities and followed a 7 min chair-based exercise video. The participant was given a 5 min break. Subsequently, the participant followed the 7 min video for a second sample. Finally, participants walked at 2 mph for 20 min on a calibrated treadmill (PaceMaster Bronze; Aerobics, West Caldwell, New Jersey, USA). Participants were also fitted with a Polar Heart Rate Monitor H7 (Polar, Lake Success, New York, USA). Heart rate samples were recorded and synchronised for each breath. Energy expenditure of the four seated conditions and slow walking (2 mph) are shown in figure 2. While sitting in the standard office chair, as expected, resting energy expenditure (sitting in a standard chair) showed a positive correlation with body weight (r=0.55, p=0.03). The relationship was described by the equation; resting energy expenditure (kcal/hour)=0.976×weight (kg)±0.917. Energy expenditure and heart rate for 16 participants while (1) sitting in a standard office chair, (2) sitting in a standard chair using the FootFidget device, (3) sitting in the CoreChair while working, (4, 5) sitting in the CoreChair while completing one of two exercise videos and (6) walking on a treadmill at 2 mph. Data are shown as mean+SEM. *p=0.03, **p=0.004, ***p<0.001. Energy expenditure increased significantly while using the FootFidget (∼30%) when compared to the standard office chair. Energy expenditure increased in all participants from a mean of 76±31 to 98±42 kcal/hour (p<0.001). Heart rate did not increase significantly, however (75±10, cf 78±14 bpm). Similarly, energy expenditure increased significantly while using the CoreChair (∼20%) when compared to sitting in a standard office chair (76±31, cf 89±40 kcal/hour, p=0.03) and again heart rate did not significantly change (75±10, cf 75 ±11 bpm). 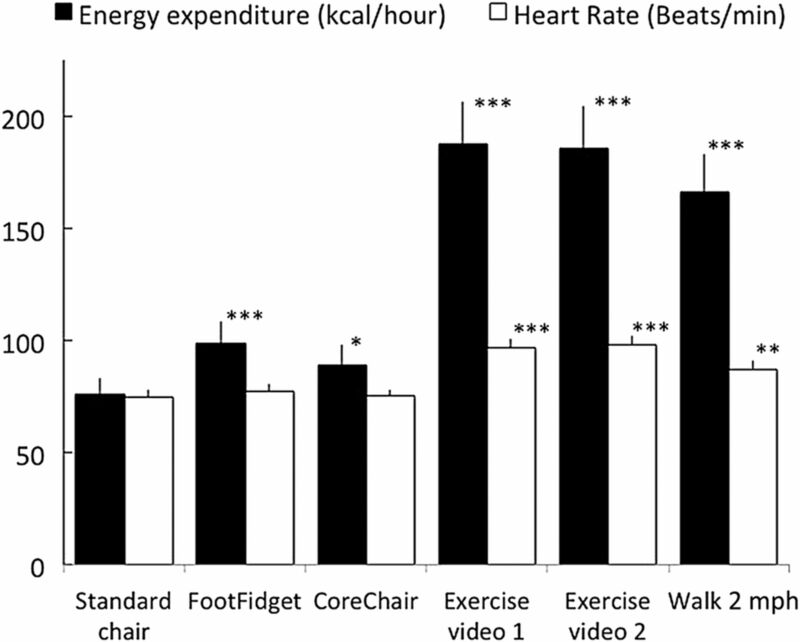 When participants engaged in exercise videos while sitting in the CoreChair, energy expenditure more than doubled above sitting values (76±31, cf 189 ±77 kcal/hour, p<0.001). Heart rate increased significantly as well, from 75±10 to 97±11 bpm (p<0.001). These changes were physiologically similar to the changes in energy expenditure and heart rate that accompanied a 2 mph walk (figure 1) (166±64 kcal/hour and 87±14 bpm). Overall, footrests and chairs that encourage movement while working increase energy expenditure by about 20% but are not associated with increased heart rate. Interestingly, a person can participate in exercise while siting and increase energy expenditure and heart rate to levels comparable with taking a walk. In adults, most sitting occurs while people are at work.26 ,27 This is attributed to the computer-based nature of modern work and to standard office design, both of which encourage employees to remain seated throughout the majority of work hours. Although standing and/or walking while working are attractive solutions for reversing excessive sitting,28 they are not practical for many employees.29 Another attractive example is to incorporate walking breaks throughout the workday;29 ,30 however, many companies cannot allow this because it interferes with workflow.31 Innovative approaches are needed to help sedentary office workers move more. What can be performed to help employees who cannot get up from their desks? One approach could be to render sitting more active, which is called, ‘dynamic sitting’. People who fidget while sitting can increase energy expenditure by 5–10% above resting values.14 In order to exploit this effect, several manufacturers have designed specific pieces of furniture that directly encourage an office worker to incorporate fidgeting movements while working at their usual business tasks. One popular example is replacing office chairs with large rubber balls (Swiss Balls).32 Using a Swiss Ball, an employee needs to continuously adjust their balance and deploy trunk and back muscles for support. Other ‘dynamic sitting’33–35 solutions are being examined whereby furniture design is used to encourage chair-based fidgeting and/or leg movements. In this paper, we critically evaluated the thermogenic impact of these innovations. The findings from our studies were clear. When a person sat on a chair that promoted fidgeting or used a footrest that promoted fidgeting, energy expenditure increased significantly by about 20%. This degree of activity however was insufficient to increase heart rate. These studies also demonstrate that when a person partook of purposeful exercise while seated, energy expenditure increased twofold (figure 1). In this case, heart rate increased substantially as well—to the same degree as a 2 mph walk. We concluded that chairs and gadgets that promote fidgeting while sitting at work are exothermic but are unlikely to contribute to aerobic fitness. However, a person can conduct an exercise routine while sitting in their office chair, which is exothermic and aerobic benefit. There are few studies to directly compare these with. However, it is known that office furniture can be manipulated in order to promote daily activity whether this is through standing desks or treadmill desks.36 ,37 These systems have been widely deployed in many companies, and direct, albeit limited, data show improved healthcare outcomes and benefit productivity.38 ,39 Chair-based movement will need to go through a rigorous validation process in order to understand whether such devices benefit productivity and improve health. There are several limitations to our studies, which we recognise. First, our studies were conducted in a laboratory environment, although we ensured that people partook of usual work tasks while measurements were gathered. Whether these approaches would sustain the responses we documented in the ‘real world’ will require a field-based study. Second, we did not directly assess true productive, which our prior work has shown to be critically important for successfully deploying these types of equipment in the workplace.36 ,37 Third, the changes in energy expenditure and heart rate we measured are sufficiently encouraging that we would want to conduct future studies to assess health impact (eg, glucose and lipids). However, the data shown above are only suggestive of such benefits. Despite these limitations, the results of these straightforward experiments are encouraging. They suggest that it may be worthwhile examining ‘dynamic sitting’ interventions in real-world workplaces. In conclusion, here we demonstrate that chair design and under-desk gadgets can improve energy expenditure. Furthermore, the data demonstrate that the chair-based exercise can significantly increase energy expenditure and heart rate to the same extent as a 2 mph walk. The value of such approaches in real-world offices remains to be determined. Innovative approaches are necessary to help reverse sedentary behaviour and the ill health associated with it. The authors thank volunteers and Sabrina J Nelson for technical support.
. The energy cost of walking before and after significant weight loss. Med Sci Sports Exerc 1995;27:888–94.
. Effect of sedentary activities on resting metabolic rate. Am J Clin Nutr 1994;59:556–9.
. New methods for calculating metabolic rate with special reference to protein metabolism. Nutrition 1949;6:213–21.
. Cost-effectiveness and affordability of interventions, policies, and platforms for the prevention and treatment of mental, neurological, and substance use disorders. In: Patel V, Chisholm D, Dua T, Laxminarayan R, Medina-Mora ME, eds. Mental, neurological, and substance use disorders: disease control priorities. 3rd edn. Vol 4. Washington (DC): The International Bank for Reconstruction and Development/The World Bank, 2016:21936.
. Stability ball sitting elevates peak arm ergometry oxygen consumption and heart rate. Int J Exerc Sci 2012;5:360–6.
. Effect of using a treadmill workstation on performance of simulated office work tasks. J Phys Act Health 2009;6:617–24.